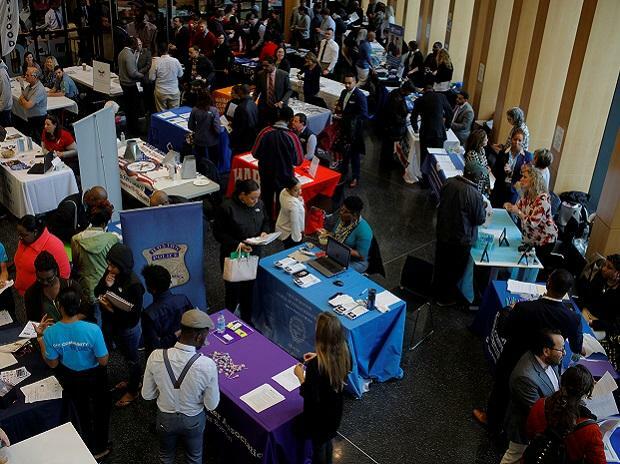 US employment growth almost stalled in February, with the economy creating only 20,000 jobs, adding to signs of a sharp slowdown in economic activity in the first quarter. The sharp step-down in payrolls was another blow to President Donald Trump who has suffered a series of setbacks in recent weeks, including failed nuclear talks with North Korea, a record goods trade deficit despite his administration’s “America First” policies and the economy missing the White House’s three per cent annual growth target in 2018. But the stumble in job growth, which followed two straight months of hefty gains, likely understates the health of the labour market as other details of the closely watched employment report were strong. The unemployment rate fell back to below four per cent and a wider measure of underemployment fell by the most ever. In addition, annual wage growth was the best since 2009, and the economy created 12,000 more jobs in December and January than previously reported, bringing the total for the two months to 538,000. “We had warned that recent employment gains had overstated the underlying strength of the US labour market,” said Harm Bandholz, chief US economist at UniCredit Research in New York. “And the correction now came in February with a bang, rather than spread out over various months.” Federal Reserve Chairman Jerome Powell made no mention of the latest numbers in remarks delivered more than 12 hours later, noting simply that most measures of the labour market “look as favourable as they have in many decades” and adding that there is “nothing in the outlook demanding an immediate policy response”. But the mixed report was another indication the economy, which in July is set to mark a record 10 years of expansion, is slowing as the stimulus from a $1.5 trillion tax cut and increased government spending ebbs. And it supports what Powell on Friday called the Federal Reserve’s “patient, wait-and-see approach to considering any alteration in the stance of policy”. The record goods trade deficit is also hurting activity as well as slowing global economies. Growth estimates for the first quarter are around a one per cent annualised rate. Economists polled by Reuters had forecast nonfarm payrolls rose by 180,000 jobs last month. In addition to the weather and rising worker shortages, a stock market selloff and jump in US. Treasury yields in late 2018, which tightened financial market conditions, also likely curbed hiring. The length of the average workweek fell to 34.4 hours last month from 34.5 hours in January. US stocks fell as the employment report added to concerns of softening global growth sparked by weak China export data and a prolonged slowdown in eurozone. The dollar dropped against a basket of currencies. US Treasury prices were mixed. Job gains over the last two months averaged 186,000 per month, well above the roughly 100,000 needed to keep up with the working-age population. The unemployment rate fell two-tenths of a percentage point to 3.8 per cent in February, also as federal government workers who were temporarily unemployed during a 35-day partial shutdown returned to work. The longest shutdown in US ended on January 25.